fettuccine, pad thai, and even coconut chicken, all in their raw vegan version. It’s a great way to have a quick, impressive healthy meal. This is a crisp clear well laid-out cookbook and the photographs alone would make you love it. Everyone wants pictures to see if what they are creating looks like what the cook/author has in mind. This book has gorgeous lifelike photos. At a current Cookbook Discussion Club I attend, several people said they tend to not buy a cookbook unless it has good photos. This one would sure meet their approval. 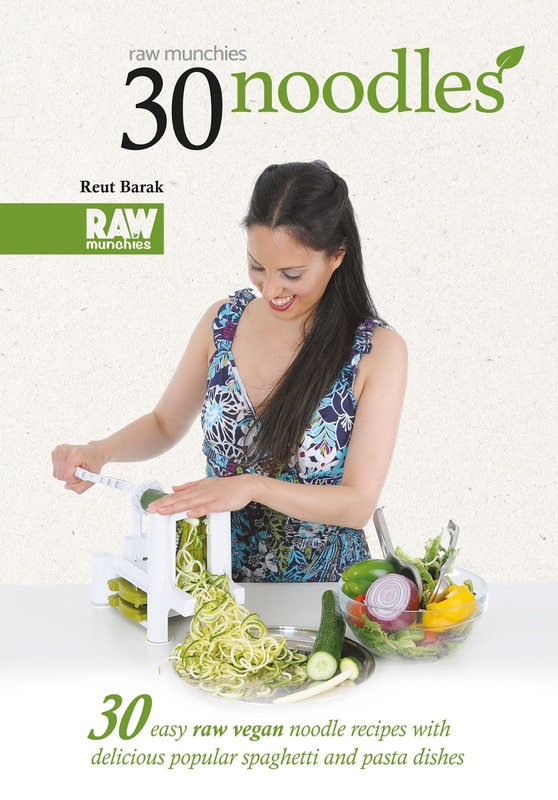 I have raved about photos but another ingredient of this cookbook (sorry couldn’t resist saying that) is that the recipes are clear, easily understandable and every piece of information you need is there…prep time, servings, ingredients, how to create pastas from specific vegetables, detox, hydration, well, you can see I could go on & on. While this is a Vegan cookbook in many ways, I am not a Vegan and found many recipes I would enjoy making and adding to our meals. There is another feature in this cookbook that is always a prerequisite with me. It’s educational and it has an excellent index. Without a good index for accessibility, you really only have something to browse, like a magazine. There is not a thing wrong with wanting to browse. We all need ideas now and then. It is just that I like to be able to use a cookbook in many ways. Maybe I have an ingredient I need to work around; a particular meal I need to create and so forth or maybe I want to browse. This cookbook provides all of those choices. Click HERE for free XTRA Giveaways. It wasn't a difficult review to write. When you love to cook like I do, the clear recipes and photos as in your book, are a cook's dream. I hope people look at this one and your other "Raw Munchies" books. Best of luck with the tour and your book. If you want more recipes - there's tons of free stuff on rawmunchies.org/recipes. Enjoy!! I will be on the road a little bit of the day so will miss your Webinar but I do hope people will take advantage of it. To access all of the info about it and other freebies click on the link above, right under my review. And...don't forget to sign up for the Giveaway just above the comments here. This looks wonderful!! I've been vegetarian for 20 years and love reading any related resources for recipe inspiration. I have to try that meatball recipe, it looks so good!